50 years into her reign as the Queen of the Blues, Alberta Adams still dazzles. The undisputed queen of Detroit blues, Alberta Adams has only been at this for, oh, fifty years, or so. Though she recorded some now highly collectable records for the Chess label in the 1950s, Ms. Adams has concentrated most of her energy on her live performances. She started out as a dancer in the 1930s, but found singing more to her liking. In short order, she became one of the big stars of the Detroit music scene in the 1940s, when Paradise Valley and Hastings Street were vibrant and non-stop. She toured with Louis Jordan and, after having heard her at the Flame Show Bar, Duke Ellington took her to Europe with him. She's been around the world with some of the biggest names in music, but Alberta Adams has always been a proud Detroiter. She can be especially proud of the fact that she is helping to put Detroit back on the blues map. With the release of her first full-length album, "Born With The Blues," on Cannonball, this 70-something powerhouse finds herself being nominated for six W.C. Handy awards (the blues world's equivalent of a Grammy). 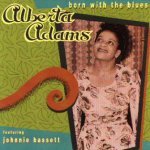 Alberta's performance on "Born With The Blues, " on which she is backed by no less than Johnnie Bassett and the Blues Insurgents, covers a wide stylistic palette, from the brassy and sassy cover tune (reminding a bit of Jeannie Cheatham), to the after-hours mellowness of "Blues Mood" and "Searchin'," (reminding a bit of Katie Webster) with a wonderful Bill Heid piano accompaniment. That these are Adams originals and the best cuts on the disc is telling of this blues woman's magic. Alberta Adams has been proving for half a century that she's the real deal. This review is copyright © 2000 by Mark E. Gallo, and Blues On Stage, all rights reserved.